We’re growth hack media. BNN Campaigner leverages the largest local news network in the world to expose and promote campaigns for social good. How “breaking news” is more engaging and cost efficient than Twitter advertising. Salesforce’s July 2015 Ad Benchmark report indicates the average Twitter CPM (cost per 1,000 impressions) is $8.92. We guarantee that our Twitter CPM is ~ $4.00. Amplification of one tweet from @RaceMovie by the BNN yields over 400 RTs and 300 likes. The total social reach of this one time amplification is over 600,000. 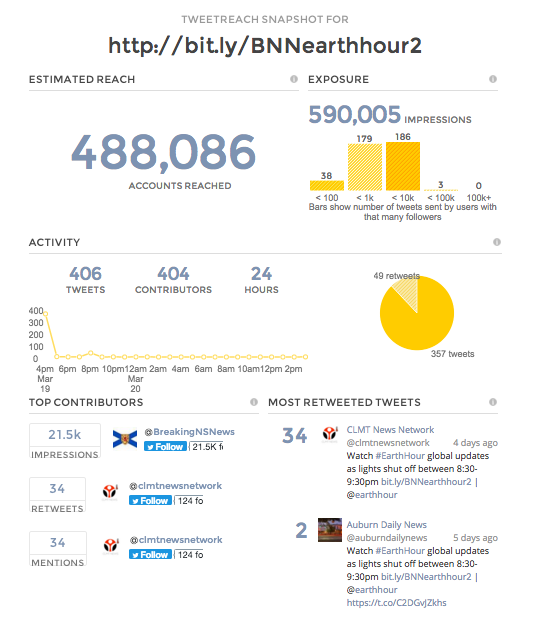 We use Tweetreach.com (report explainer here) to document metrics of one specific amplification for #EarthHour on March 19, 2016. Tweetreach’s Exposure, calculated in Impressions, is the potential reach of the amplification. Twitter’s definition of Impressions is different, it is the algorithmic display of the tweet in follower timelines (they don’t show it to everybody). Our average Twitter impressions, not shown on the report, is ~4–5% of Exposure. For the above report indicating Exposure of ~600,000, the actual Twitter impression is ~24,000–30,000. 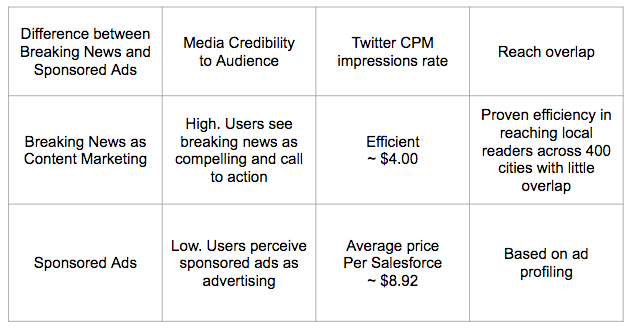 Salesforce’s July 2015 Ad Benchmark report indicates the average Twitter CPM (cost per 1,000 impressions) is $8.92. We can guarantee that our Twitter CPM will ceiling at $4.00. The BNN has developed a unique support network platform that amplifies the voices of advocates, cohorts and affiliates of our clients. Simply put, by providing advocates with media exposure, they will reciprocate the good will with committed campaign engagement. It works especially well with federated organizations with local operatives. Contact us for details. The BNN’s news feeds contribute about 100,000 local articles per week, averaging 20+ million impressions and clickthrough engagement of over 600,000 every week. All news is consumed at the local level, a media segment untouched by national news networks and publishers because it has proven unscalable. With over 1.2 million followers in aggregate, BNN is ranked 5th in national reach among all local newspapers after @NYTimes, @WashingtonPost, @USAToday and @LATimes.